I love Nina Simone's voice. Acutely, I mean her singing voice, but I've always perceived considerable social consciousness in the husky, soulful renditions of songs she wrote and covers such as "Here Comes the Sun." The 2015 Netflix documentary, What Happened, Miss Simone, furthered my appreciation for both the music and activism of the artist born Eunice Waymon, in North Carolina in 1933. After a varied and estimable career starting as a classical music piano-playing prodigy, Nina Simone died in 2003. 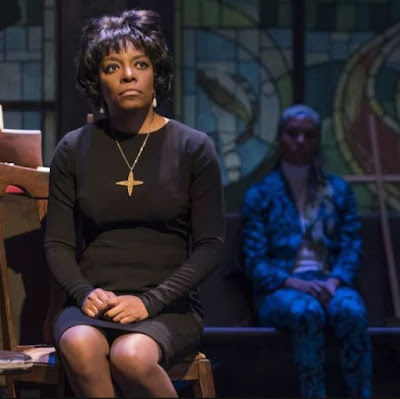 Rather than retrace her entire life, I like how playwright Christina Ham focuses Nina Simone: Four Women--now running at Northlight Theatre in Skokie under the direction of Kenneth Roberson--on a moment in time, in 1963. Though some of the biographical specifics are presumably fictionalized for the sake of storytelling, Ham chronicles a visit by Simone--terrifically played here by Sydney Charles--to Birmingham, Alabama in the wake of the white supremacist bombing of the 16th Street Baptist Church, which killed four young girls. As the play enunciates, the visit coincided with--or resulted in--Simone becoming far more strident in the subject matter of her music. In other words, her voice changed. No longer was she, as suggested in the show, a "supper club singer for white folks," but--with songs like "Mississippi Goddam," which reflected the Alabama bombing as well as the 1963 murder of African-American activist, Medgar Evers, in Mississippi--a potent force in the Civil Rights Movement. 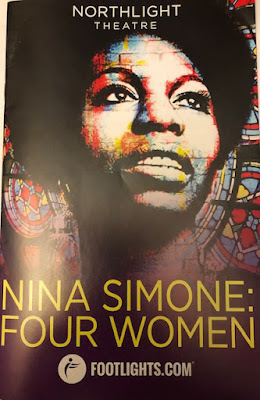 Given this illumination about how Ms. Simone's career shifted, the gravitas of the specific incident in Birmingham, the Civil Rights Movement overall and the--at times, unjustly limited--role played by powerful women, Nina Simone: Four Women makes for nothing less than a worthwhile 100 minutes. This is especially true given the acting and singing talents of Charles and her cast mates: Deanna Reed-Foster as Sarah, a Birmingham maid; Ariel Richardson as Sephonia, a young activist whose lighter skin tone gets her derided as "yellow" by Sarah; and Melanie Brezill as Sweet Thing, a hot-tempered woman who arrives late in the show. The character names coincide with those mentioned by Simone in her 1966 song, "Four Women," in which she dubs herself Peaches. The show's musical director, Daniel Riley, often plays the piano onstage, accompanying songs mentioned and "Sinnerman," "Brown Baby" and "To Be Young, Gifted and Black," among others, upon a striking set by Christopher Rhoton representing the bombed out church. So Nina Simone: Four Women can probably technically be considered a revue, and thus a musical, even if it feels more like a play with music, however imprecise the delineation. The musical numbers are certainly highlights; all quite well done. 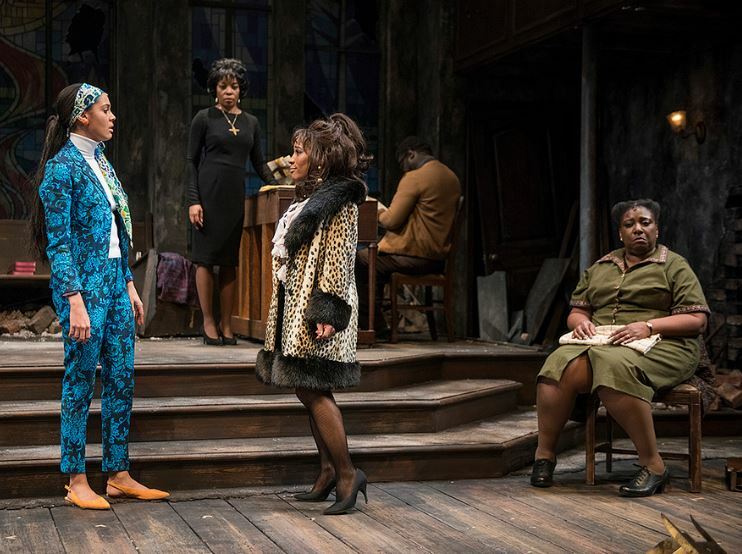 But while I didn't feel the drama was consistently riveting, nor the narrative entirely realistic in terms of the gathering of the women, there is considerable virtue in what the show imparts beyond how well it entertains. This probably isn't where you should begin in learning about the great Nina Simone, and certainly not where you should end, but through the four women onstage--reflecting unique perspectives while loosely representing the unknown adulthood of the murdered lost girls--you should get a decent sense of discontent, struggle, pride and passion. And how she found her true voice.